Gerald was baptised at St Helena’s, Folksworth, Peterborough on 13th January 1882 and the sponsors were Robert Bruce Gaskell, father’s brother; Armand Temple Powlett ; and Isabella Catherine Blake Hugo, mother’s sister. 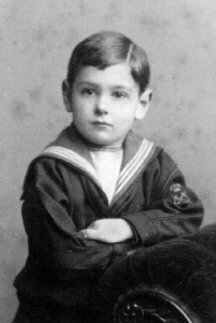 Gerald entered the Royal Navy via the “Britannia” 0n 15th September 1893; he was a Naval Cadet and was shortly posted to HMS Hood, a Battleship. He became a Midshipman on 15th January 1900. On 6th August 1900, he joined HMS Minerva, a Cruiser. He was lent to HMS Constant on 9th November 1900. According to the 1901 Census he was a 19 year old Midshipman aboard HMS Furious at Sheerness, Kent No. 4 Buoy. On 15th July 1901 he was promoted to the rank of Acting Lieutenant In November 1901 he transferred to HMS Resolution, a Battleship. In December 1901, he was studying at The Royal Navy College to study gunnery, which included a spell on HMS Excellent and HMS Scylla. On 5th June 1902 he joined HMS Palls, operating in the Atlantic off North America and the West Indies. On 21st May 1904 he joined HMS Suffolk operating in the Mediterranean. On 21st May 1904 he was posted to HMS Victory at Portsmouth, land based, to work at the school of Physical Training. On 30th May 1908, as a Lieutenant, he was transferred to HMS Dreadnought under Admiral William H May, Commander in Chief Home Fleet, and Gerald was responsible for all Physical Training for the Home Fleet. On 26th March 1911he was posted to HMS Indefatigable, a Cruiser, responsible for physical training duties and on 30th September 1911 was promoted to Lieutenant Commander and was located at the Royal Naval Barracks in charge of Physical Training. 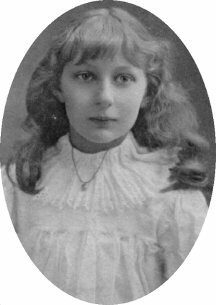 Faith Gaskell, who was born about 1904, married a William Russell, did not have any children and died in 1947. Hope Gaskell, who was born about 1906, married a Seymour Glendinning, did not have any children and died on 21st November 1989. John Tozer born in 1966. 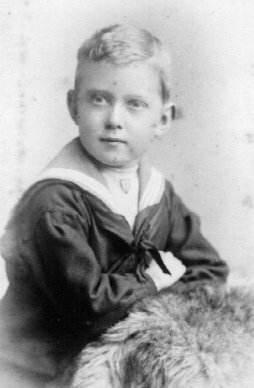 Gerald was killed in action on HMS Good Hope in the Battle of Coronel in the Pacific Ocean off Chile on 1st November 1914. All hands were lost. Administration was granted to his wife,. Jane, on 4th January 1915 with his effects valued at £300. The memorial to Gerald and those who died during the naval action is at Portsmouth on Southsea Common. His address at the time of his death was 49 Palmerston Road, Southsea, Hants. Hugh Selwyn Gaskell writes in “Diary of an MO” that on May 1st 1916 he visited Southsea to visit his mother and Jane Meriel, who were staying with “the nieces” Faith, Hope and Charity. Also staying was Eileen, daughter of Charles Bruce and Evelyn Gaskell. According to the 1891 Census, John Charles Temple Gaskell, known as Charles, was a boarder, with his older brother Hugh, at 87 Woodside Green, South Norwood, Croydon, Surrey. He married Mary (“Mamie”) Agatha Folds in 1914 (Sep Q Guildford 2n 243 )and they had two daughters about whom nothing further is known. To: Lieut JCT Gaskell, Northampton Regiment, 74 Madeley Road, Ealing, London. From: The Quartermaster-General, War Office, London, S.W. I am directed to inform you that passage to Bombay will be provided for you probably on board the Transport Sicilia and that you should embark on or about 15th January '03. His probate records that the value of his effects was £3057.15.10d. Christopher was the fourth son of Thomas and Horatia and was born at Leaton Vicarage, Salop. He was baptised on 7th June 1885. His sponsors were Christopher Hales Wilkie, unknown: William Plumer Gaskell, father’s brother; Gertrude Townsend, friend of the family. Christopher emigrated to Canada to farm, as a young man. Having enlisted in the Canadian Infantry, he was wounded in Bethune, France 1915 - his arm was shattered. On 21st February 1931, Christopher crossed the border from Canada into Buffalo, New York State, USA, where he met his brother, Hugh. Christopher had a friend with him, Rosamond Roberts. He married and separated after WW1 and had no children. 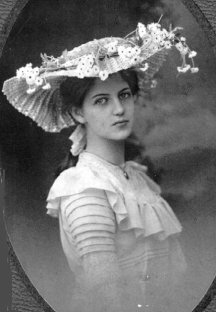 Horatia Margaret, known “officially” as Margaret but called Daisey, was the eldest daughter of Thomas and Horatia and was born at Leaton Vicarage, Salop. She was baptised on 11th August 1889. The sponsors were Rev. H F Bather, Vicar of Meole; Amy E Haslehurst - see sponsor to John Charles Temple Gaskell. She married Edward Wynter Bulteel who as a Lieutenant of Royal Naval Barracks, Portsmouth, was killed in action (blown up by a torpedo) in a battle in the North Sea on 10th June 1915, 10 months after joining up. He is buried in grave R.N, Plot. 35 at Shotley, St Mary Churchyard, 2 miles north of Harwich. Probate was granted to George Bulteel Moir Byres, gentleman, and Douglas Moir Byres, Lieutenant in His Majesty’s Army. His effects were valued at £7476.1.5d. Peter Edwards born c.1946, who is unmarried and teaches in Barrie, Ontario. Stephen Edwards born c.1950, who lives with his father and is unmarried. Susan Edwards born c.1952, who lives in Whitehorse, Yukon and is unmarried. Robert Edwards (Bob) born c.1953, he is in the Canadian Navy and is in command of HMCS “St Johns”, a destroyer. Jennifer Edwards (Jenny) born c.1955, married with a daughter born c.1985 and lives in Ottowa. Rosemary died on 31st December 1991. At Margaret's funeral in 1987, her grandson Bob, read the following. "Margaret Bulteel was born in Leaton, England and lived in that country until she came to Canada in 1947. As a clergyman's daughter, she recognised, early in life, her responsibilities as a Christian in supporting the work of the church. One of the contributions she most enjoyed, was that of being an enthusiastic member of the choir, participating in this way well into her 80's. She lived her life as a good Christian, showing steadfast courage and selflessness, and cheerfully accepting God's will at all times. Margaret was no stranger to grief and sorrow, having lost her beloved husband as a young bride of 10 months, when he was killed in action in the First World War. She also lost her brothers and her brother- in- law under the same circumstances. Despite these tribulations, she devoted herself to raising her daughter Rosemary, born soon after she was widowed. As well as handling her responsibilities admirably as a single parent, she also managed to contribute to the community in the areas of practical nursing and voluntary work. After the war she chose to leave her family and friends to follow her now married daughter to Canada. As the family grew, Margaret welcomed the challenge of helping to raise and enjoy her grandchildren. A devoted mother and grandmother, she gave freely of her time and attention to the family. She was also a very strong and independent lady who maintained a healthy balance in pressing her own interests including church work. Warm hearted and extroverted, she was everyone's friend. As a person of high moral principals, she set a fine example of integrity and courage to all who knew her. Having formerly been an eager participant in all phases of her life, Margaret stoically and serenely accepted, in her later years, the limitations imposed upon her by her infirmities. This won her the admiration of her family, and endeared her to all around her. She will be sorely missed and never forgotten by those who love her. We rejoice in the faith that she is in the arms of the Lord, and reunited at last with her husband and dear ones. Her example, spirit and vitality live on in the hearts of her family." She lived with her parents and after the death of her father, with her mother until the mother’s death, when she moved to Southwold, before going to live in a sheltered home in Cambridge where she died.